It’s not just that people eat more when they’re tired, it’s the kind of foods they eat that lead health problems too. In a study conducted in 2016 scientists found that participants who were sleep deprived were not only hungrier than their well-rested counterparts but also ate food that had 50 percent more calories and twice the fat as the snacks chosen by participants who’d gotten a full 8.5 hours of sleep. Getting enough sleep is about more than being well rested. It’s about giving your body a chance to function at its best. Without enough sleep, it just can’t. Many people get frustrated with themselves when they’re trying to eat healthily but keep reaching for a candy bar instead of a carrot stick. While part of it may be that candy bars taste better than carrot sticks, but part of that tendency is the body’s reaction to sleep deprivation. In the workplace, better sleep and eating habits lead to healthier employees who produce more and take fewer sick days. Making your health a priority means putting sleep at the top of your list. Committing to eating a well-balanced diet begins by creating the right conditions for better sleep. Here are a few tips to help you get a better night’s sleep. Set a Consistent Bedtime. When you go to bed at the same time every day, your body establishes a rhythm wherein it releases hormones at the correct times throughout the day to help you feel tired at night and wake up in the morning. Create the Right Atmosphere. 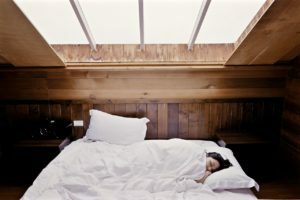 Most people sleep more comfortably in a cool room that’s between 65-72 degrees. Try out a few different temperatures to see what works best for you as everyone is different. Get the Right Mattress. If your mattress has peaks and valleys or makes your back hurt, it could be a big reason you’re not getting the rest you need. Whether you’re a back, side, or stomach sleeper, there’s a mattress out there that can give you the stability and support you need for better sleep. Diet and Exercise. Fat-filled meals close to bedtime can cause discomfort, though you may need a light snack so that hunger doesn’t wake you during the night. Finding the right balance may take some trial and error, but you’ll soon learn what works and what doesn’t. Let us know what you think about nutrition and sleep in the comments below! This entry was posted in Fitness, Nutrition by jveffer. Bookmark the permalink.